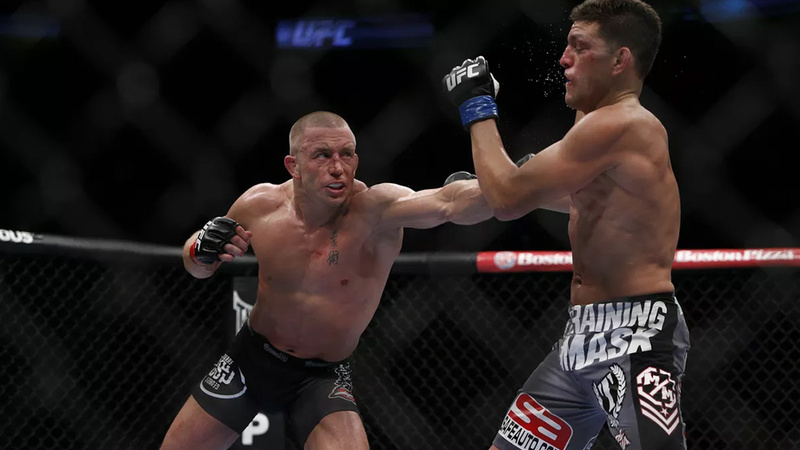 Nick Diaz brought out some interesting theories on the biggest fight of his career against Georges St-Pierre at UFC 158 back in 2013. Last week, UFC president Dana White told UFC Unfiltered that the promotion is currently working on putting together a lightweight slugfest between former UFC middleweight and welterweight champion Georges St-Pierre and Nate Diaz for UFC 227 in Los Angeles, Calif on Aug 4. Diaz, 33 hinted the fight is far from done on Friday afternoon via social media post, accused St-Pierre of using PEDs ahead of his welterweight title defense against older brother Nick Diaz at UFC 158. These allegations started back in 2016 when older brother Nick Diaz made a statement of being “poisoned” before the fight. Later Nick Diaz’s trainer Richard Perez revealed that nurse from St-Pierre’s team gave Nick “some kind of stuff.” Nick eventually lost to St-Pierre via unanimous decision. Diaz last competed against Anderson Silva that end in a no contest at UFC 183, regain UFC eligibility after serving a one-year suspension for missing three out-of-competition drug tests within a 12-month span.